All seven issues will feature two covers, each by George Pérez and Jim Lee. Alexander Luthor continues to try to create the “perfect Earth” with the help of Brother Eye and the heroes whose power he has tapped for his tower. Meanwhile, the Supermen of Earth-1 and Earth-2 put aside their differences to fight for a common cause, while the Superboy of Earth-1 and the Superboy of Earth-Prime, who has managed to return to wreak more havoc, simply fight — and this time, it’s to the death. There’s one heckuva lot going on in this penultimate issue of Infinite Crisis, so don’t feel inadequate if you find yourself getting lost. Hell, the busy art layouts are enough to induce that sort of confusion, let alone a script that’s choc-a-bloc with this and that happening. The fault for the business of the layouts cannot be laid at the feet of Phil Jimenez, Jerry Ordway, George Pérez, and the eight (!) other artists charged with bringing this epic to the printed page. Writer Geoff Johns has given them a lot to illustrate and keep clear, so it’s no wonder when some of the most interesting bits get lost in the shuffle. Even though the art was split among several hands, I really didn’t feel the dissonance. For the most part, the guest artists stuck to specific storylines, and that makes sense in the overall tapestry. It certainly made sense for Perez to do the two-page spread of the multiple Earths in conflict, given his history. (The page is also home to a fantastically elaborate in-joke; Earths 154 and 462 are slammed together into a new Earth where the heroes are waging a . . . wait for it . . . Civil War. Yeah, 154 + 462=616. Funny). Michael Aronson: Infinite Crisis is a big, giant, incoherent, wonderful, silly mess. I can’t help myself, my fanboy passion kicks in whenever I look at this comic. It needed eleven artists because this comic would have killed only one. Infinite Crisis is truly the spectacle so large that even George Perez, the Hercules of crowd scenes, needs ten collaborators to illustrate this book. I love InC for that. Kevin T. Brown: Overall, IC #6 is the best issue to date. It’s also the toughest one to review. I felt after issue #4 that Geoff Johns had hit the pinnacle of the series. This issue proved that wrong. While that issue and this both have received the highest bullet rating we can give, I would have loved to go much higher. Right now I feel like Nigel Tufnel saying we should go one louder. Heck with it, this review goes to 6 Bullets. One louder. This issue is deserving of it. Man, what a ride! Following in the footsteps of Sandra Hope (who outlined her inking process for the cover to Infinite Crisis #6 a week or so back at the Sun of Gelatometti site, colorist Alex Sinclair has posted a step-by-step of how he colored the cover for the penultiamte issue of the miniseries. Sinclair posted the guide late last week, and we re-present it here for your reading pleasure, and also to get you to check out Sun of Gelattometi more regularly…it’s good stuff. While a penciled version appeared during WizardWorld: LA, and a "preliminary" version with the original March solicitatons, respectively, here for the first time are the full Jim Lee and George Perez covers to next week's Infinite Crisis #6. Newsarama’s friends over at the Sun of Gelatometti blog are once again giving readers insight into the artistic process… this time inker Sandra Hope is breaking down her inking process over Jim Lee’s pencils of his cover to Infinite Crisis #6. According to DC Comics, Infinite Crisis #6 is now scheduled to be released on April 5th, while #7 is scheduled for May 3rd. Infinite Crisis #6 has been moved up a week and is now scheduled to ship on March 29th (previously listed for April 5th), according to www.dccomics.com and www.newsarama.com . I've been reading a bit of misinformation regarding my involvement with INFINITE CRISIS #6. When I read I was drawing all of Issue 6 I knew that the lines of communication had gotten tangled up a mite. Here's the real scoop: Due to scheduling conflicts and time constrictions I will only be drawing 5 pages of issue 6, instead of the originally planned 12. Three of those pages are being reproduced from my pencils while the others (a double-pager) have been pencilled and inked by me. This will allow me to get right to providing more artwork for Issue 7, although I don't know exactly how many pages that will be. Contrary to an earlier rumor that George Perez will draw the entire issue of Infinite Crisis #6, I hear that his page count for that issue will be closer to 17, so that will still leave almost half the issue for the rest of the artistic team to handle. I’m also told that the Multiverse will NOT be reestablished at the end of the miniseries. As before, there will be just one Earth. News: Infinite Crisis #6 To Feature Digital Ink? The word on the floor was that "Infinite Crisis" was late due to delayed scripts. 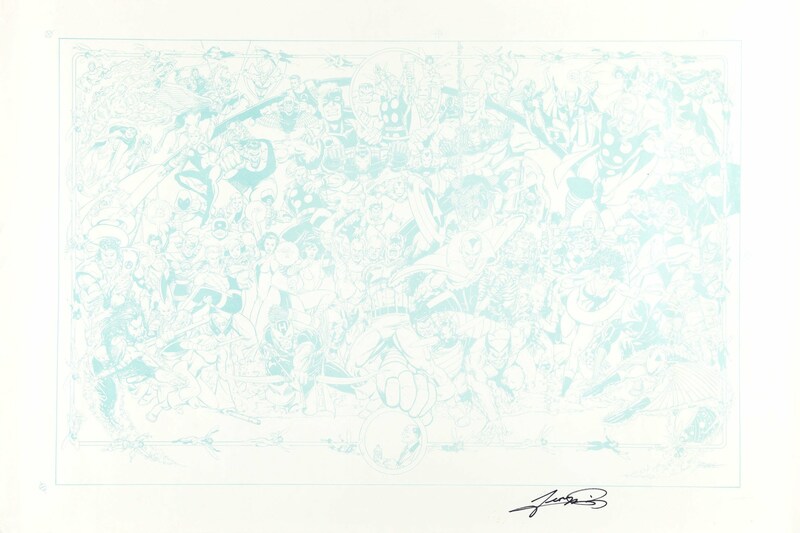 In order to speed the slipping "Infinite Crisis," George Perez will pencil issue #6 of the series, the artwork being digitally reproduced from his pencils. Looks like another release date shift for Infinite Crisis. As mentioned in "DC Sends Infinite Crisis #4 Back To Press," #6 is now scheduled to arrive in stores on March 29th. As seen in the article "Infinite Crisis #3 Sells Out, Back To Press" at www.comicbookresources.com, the release date of Infinite Crisis #6 has shifted from March 8th to April 5th. News: Infinite Crisis "One Year Later"
The staggering repercussions of DC Comics' INFINITE CRISIS continue to spread in March, as the heroes of the DCU take a sudden leap "One Year Later." Spinning out of the incredible ending of INFINITE CRISIS #5 (DEC050244), the "One Year Later" issues introduce a spectacular array of new creative talents and startling new directions across the DCU. Now, DC unveils the complete list of "One Year Later" titles, along with their creative teams! For more information on these titles, or to see their covers, visit the March in-store titles page of the DC Comics website at www.dccomics.com/../?dat=20060301&s=31. * INFINITE CRISIS #1 (AUG050205) and INFINITE CRISIS #2 (SEP050228) are available for reorder. * INFINITE CRISIS #3 (OCT050239) is available for advance reorder and is scheduled to arrive in stores on December 28. * INFINITE CRISIS #4 (NOV050251) is solicited in the November Previews (Volume XV #11) and is scheduled to arrive in stores on January 25. * INFINITE CRISIS #5 (DEC050244) is solicited in the December Previews (Volume XV #12) and is scheduled to arrive in stores on February 15. * INFINITE CRISIS #6 will be solicited in the January Previews (Volume XVI #1) and is scheduled to arrive in stores on March 8. * COUNTDOWN TO INFINITE CRISIS SECOND PRINTING (FEB058329), PRELUDE TO INFINITE CRISIS (MAR058148), THE OMAC PROJECT TP (SEP050257) and the DAY OF VENGEANCE TP (SEP050258) are available for reorder. * The VILLAINS UNITED TP (OCT050276) is available for advance reorder and is scheduled to arrive in stores on December 14. * The RANN-THANAGAR WAR TP (OCT050275) is available for advance reorder and is scheduled to arrive in stores on December 28. DC Comics has provided CBR News with their solicitation text and cover images for comics and product shipping in March of 2006. Which events in this continuing epic will lead us to One Year Later? What worlds live? Which hero dies? Retailers please note: This issue will ship with covers by Lee & Hope (approximately 50%) and Pérez (approximately 50%). It's One Year Later…and the JSA has been torn asunder! Legendary JSA writer Paul Levitz, award-winning artist Rags Morales (IDENTITY CRISIS, WONDER WOMAN) & inker Dave Meikis (HOURMAN) deliver a moving 5-part tale of heroes picking up the pieces of their lives as they face of against one of their deadliest enemies! Featuring flashback sequences illustrated by Luke Ross (JONAH HEX)!